The Orlas Creator additive manufacturing system works with a range of metals and can print in a few hours, allowing tool-free manufacturing of metal parts directly from CAD data. The system includes CAD/CAM software. The blade design ensures smooth operation and increased build speeds, producing parts up to 30% faster. It features an open material system and a smart cartridge concept that allows for swift, safe metal powder exchange. The graphical user interface (GUI) runs on a tablet, while the open platform strategy and software suite provide customization of key process parameters. A 250W fiber laser delivers beam quality and power stability. The SGI.5 version of Makino’s Super Geometric Intelligence software is for precision machining of complex, three-dimensional contoured shapes. SGI.5 can provide 20% to 60% faster cycle times while maintaining accuracy and surface finishes. SGI.5 combines the rigidity of the machine structure, kinematics of the machine drive systems, and the latest advancements in servo-drive technology with Makino’s proprietary software. This result is speed, high feeds, and tight accuracies when executing NC programs with micro-blocks whose traverse movement value is 1mm or less – characteristic of the complex, 3D, curved surface shapes found in medical high-performance milling. G6 multi-function, six-edge turning inserts – designed to fit one holder – offer high productivity and cost efficiency in applications including threading, grooving, parting, and back-and-front turning. Fully ground profiles deliver high precision, and the shape provides strong, stable clamping. Designed to fit a range of diameters extending from small, thin-wall applications up to 2.5", the system creates a smooth surface finish even in hard materials. Internal coolant capability controls temperature and relieves chip contamination at the cutting edge. 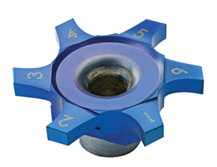 Constructed of K20 carbide with Carmex’s BLU coating, the G6 insert offers accelerated production and long tool life. BLU is a sub-micrograin grade with a physical vapor deposition (PVD) triple layer coating, providing high strength with high wear resistance.